In Year 12, my English teacher set Bernhard Schlink’s The Reader as one of our texts. The Reader is set after World War II and a major part of the novel is a trial of an SS officer who is being tried for war crimes. Schlink is a crafty writer. He neither wanted to condemn or condone what the soldiers had done during the war, but at least try to understand their actions. Soldaten is a book which also tries to do exactly that; only this isn’t a work of fiction. This book is a collection of previously undiscovered transcripts of conversations of German POWs during World War II, which the authors, Harald Welzer, a psychologist, and Sönke Neitzel, a historian, analyse to try and determine the motivation and mindset behind the terrible crimes committed during the war. This book is not an easy read. It is confronting, despite the fact I did not live through the war and it is not the actions of my fellow countrymen under attack. All I know about the war has come to me through novels and textbooks, and my German lessons at school. But even so, to read the sheer pleasure some POWs took in killing civilians point blank for a bit of fun is not easy to take. It is hard to comprehend how any human being could think this way. Still, the authors are not out to crucify these people for their acts. They try to understand why these soldiers took so much pleasure in killing by trying to understand the POWs’ frame of reference. They argue that killing is so much a part of war that the POWs did not see this as something out of the ordinary, and within their context, their job as a soldier is to kill. This may seem like a weak argument, and, to be fair, there are a small number of transcripts in the book where the POWs are absolutely disgusted and outraged by what is going on during the war. But to the soldiers, killing people is their job. And they were not the only people who had jobs during the war: ‘When societies are mobilized to fight a total war, institutions, businesses, and organisations that normally work harmlessly toward their respective peacetime goals become “essential to the war effort”’. Just because soldiers are the ones on the frontline doing the actual killing, because that is their job, does not mean that the support the rest of society offers during wartime is any less brutal. There are a few black and white photographs included in the book. One is a photo of a massacre of Jewish people, taken by a civilian watching the spectacle. It comes after reading about how they organised and undertook these horrible killings, but by only reading the words it is still possible to keep a distance from the actual event. The photograph forces the reader to see it for themselves. The most confronting thing about that photo is the fact that someone was actually there, watching, as though it were a football game, and thought it would be appropriate to take a photo of the event. But that is the whole point of the book. Why do people get so worked up over death and brutality when, as a society, we clearly know that the frame of reference is war, and war means death, not only for those who choose to fight for their country, but for innocent bystanders too? This book is frightfully matter-of-fact about the whole situation, and, while Neitzel and Welzer never once condone war or the actions of the soldiers, it makes you question your own opinions towards the very construct of war itself. Whereas Bernhard Schlink’s The Reader is a wonderful novel, it is still just that: a fictitious novel based on truth. Soldaten is the complete opposite: it is a non-fiction book and the transcripts included are the truth about what these POWs said to each other. Neitzel and Welzer add their own analysis to the transcriptions, to inform the reader as to the frame of reference within which the soldiers speak, but even so, I cannot fathom the notion that ‘soldiers kill because it’s their job’, and that’s the end of it. Maybe during World War I the soldiers weren’t really sure what they were getting themselves into. But now, thanks to technology and history, we all know what war is like. So to simply dismiss it as a particular frame of reference during which cold-blooded killing is the expectation feels wrong. Why choose (in the modern day) to be a solider at all? This book is well worth a read. It provides insights which history books do not, and deliberately sides neither with the soldiers or the civilians, urging the reader to consider the analysis presented in the book, but ultimately allowing the reader to make up their own minds about the published transcripts. 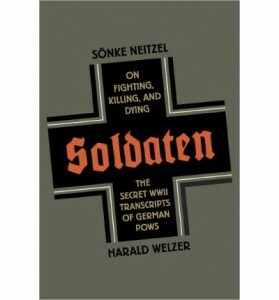 Soldaten is published by Knopf Publishing Group. War happens for lots of reasons and we haven’t yet found a way yet to avoid it – so one good reason to be a soldier, I think, would be because one believed strongly that their home, their nation, and their liberties may need to be defended. Maybe that’s not a very good answer, especially considering the world as it is today – but 60 years ago during World War II it probably would have been thought a very relevant and urgent consideration indeed! This entry was posted in Arts, Books and tagged book review, books, history, literature, non-fiction, psychology, Review, Soldaten, truth, war. Bookmark the permalink.